James Spillane, an expert on school leadership and educational policy at Northwestern University’s School of Education and Social Policy, conducted a workshop on educational infrastructure design and delivered two keynote speeches for hundreds of principals and administrators during a spring trip to Hong Kong and Hangzhou in southern China. Spillane’s research suggests that the design of physical space inside a school matters; teachers may benefit from the chance encounters that stem from working near one another inside the school building. Spillane has written extensively on policy implementation, school reform, and distributed leadership. Spillane also observed that teaching and teacher development are closely related in China. “In most U.S. school systems this tight relationship between the work of teaching and developing teaching does not exist,” he said. At the ninth Asia Leadership Roundtable in Hangzhou, China, which featured educational leadership scholars from around the world, Spillane gave the closing keynote address, titled “Research on Leadership and Teacher Learning: Back to (Research) Basics.” This talk centered on how educational infrastructures can help teachers learn from each other on the job. Spillane gave an addition keynote address called “Leading and Managing Instructional Improvement: Designing Educational Infrastructures that Work” while at the Spring of Qiantang Education Summit. 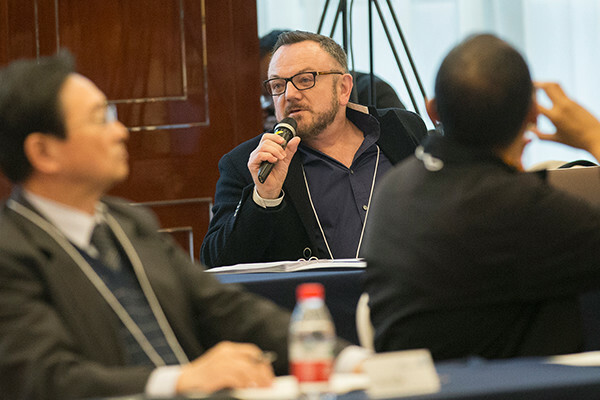 At the event, attended by over 300 principals, assistant principals, and Jianggan District education policymakers, Spillane stressed how educational infrastructure shapes the way teachers interact with and learn from their colleagues. In Hong Kong, Spillane conducted a three-hour workshop called “The Social Side of Improvement: Educational Infrastructures that Work” for 60 principals and assistant principals in an event organized by the Education University of Hong Kong. Through a group activity, Spillane introduced the concept of design thinking -- a creative problem-solving process -- and also stressed that managing problems can be more effective than trying to solve them.